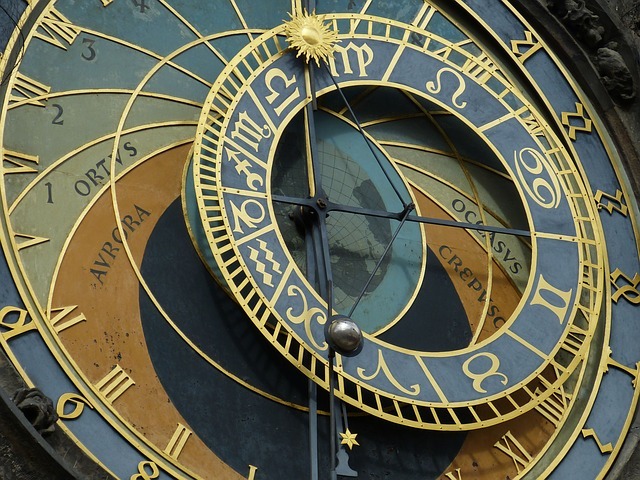 The astrological clock in Prague, built in 1410 and still working. Over the years, I have found that even some of the most open-minded people I know harbor prejudices against astrology. "I don't believe in it," some say. Others say, "It's too limiting." Others think of it quite literally, and find it hard to believe that the gravitational forces and movements of planets so far away could affect our lives so much here on earth. Astrology isn't about belief, limitation, nor is it a cause-and-effect scientific formulation for fate. Instead, it's a complex system, or a language, of symbols that have informed our lives as humans since the dawn of civilization. There is nothing to believe: one simply looks at the symbols as they are applied to the birth chart and the client's experience and see if they help to bring clarity to the path or the situation, just as dream images might. Rather than being a limitation, a defined "box" in which we're stuck (as it might seem to those who do not understand its language), astrology gives us endless boxes that open and open, giving us always something else to look at about oneself, broadening the mind so that we can identify not just as our sun sign but as the relationship between all the points in our chart, all the moving and changing points within us. The key to astrology lies in the ever interlocking cycles of complex symbols and the relationship and story between and behind them. A Western chart may look completely different than a Vedic astrological chart, or a Chinese astrological chart, but even if the symbols shift, the chart manages to balance itself out when all the points are considered, and it will say much of the same things, but in different ways, and with a different emphasis owing to culture. Because I'm a "Westerner," I use the Western system. Jung said, that "Astrology represents the summation of all the psychological knowledge of antiquity." These are the mythologies we have lived with for thousands of years, that make up the panoply of our subconscious. We have a complex, scientific, symbolic language at our disposal to help us through our paths in life, a language built by years of understanding the cyclical nature of the universe, the ways in which human experience repeats itself and how this can be reflected, or perhaps even projected, outwards onto the stars. Do the planets and stars actually affect our physical bodies in these conscripted ways? Clearly, we are all connected, and as physics will show, the movement of even a butterfly affects the entire universe. But for me, that question is too literal. I'm not interested in causality, and arguing endlessly over whether something is "real" or not. A piece of art brings us to an imaginary realm to reveal to us what is "real" inside of us. A good chart interpretation is like a piece of art: in working with the images present, specifically owing to their foundation in myth and story over eons, we are able to tease out the plot, to paint an image of the soul, to see what invisible gods are present in one's life, what daemons, what archetypes, what callings. Reality itself is fluid, shifting, and cannot be pinned at any moment outside of our own limited perceptions. As such, the question for me is not "is it real?" but "is it true?" Does it speak to a part of oneself, perhaps a part that has been starved or denied because other parts of one's self have always taken center stage? Is it useful? What is the universe saying right now? These are the questions I ask myself when I study astrology, and these are the questions I ask when I read a client's chart. Time and time again, the inner symbols, images, cycles, alignments, and relationships within the chart have reflected with stunning precision and accuracy the outward symbols and forces at work in a client's life. A chart reading is useful for any time of life, but especially for those times in which we seek a larger or different perspective on a situation, or times when we seek a confirmation of our paths. But whether we seek a simple tuning-in or help with a cosmic crisis in our lives, astrology is for any time and any occasion: it's such a rich and endless network of information as to be virtually inexhaustible. There is always more to see, more to know, more to understand. I work with natal charts, transits, progressed charts, astrocartography, relationship charts, elective (event) charts, Sabian Symbols, and use an intuitive synergistic approach that can include other forms of astrology or augury: Human Design, Tarot, Dreamwork, Astrological Dice, I-Ching, and Augur's wheel. All readings and inquiries are private and confidential, honored as a sacred and protected space. Let me know what I can help you with, and what you'd like to know!